Hello! Long time, no see! And boy, has life been happening since I last posted. Most of the radio silence of late was a result of a move to a new continent. My husband’s office in Calgary was closed down, and he was lucky to get an offer to transfer to the office in London. Three months later, here we are. In order to focus on the logistics of moving a whole family across an ocean, I put designing aside until we got here. I gotta tell ya, that was not easy! Ideas were festering in my brain and I so itched to get at my yarn and spreadsheets. But there was so much else going on, I knew it had to wait. Luckily, I had a pattern that had been completed back in June that was waiting for the right season for publishing. As the days have started getting shorter and colder here, I’m feeling confident that now is the time. So, I present the Mount Rundle Mittens. These mittens were originally designed for an event at The Loop, my local yarn store in Calgary. They had a Craft Cruise coming through and wanted some patterns and yarns from local artists and I was fortunate that they asked me. 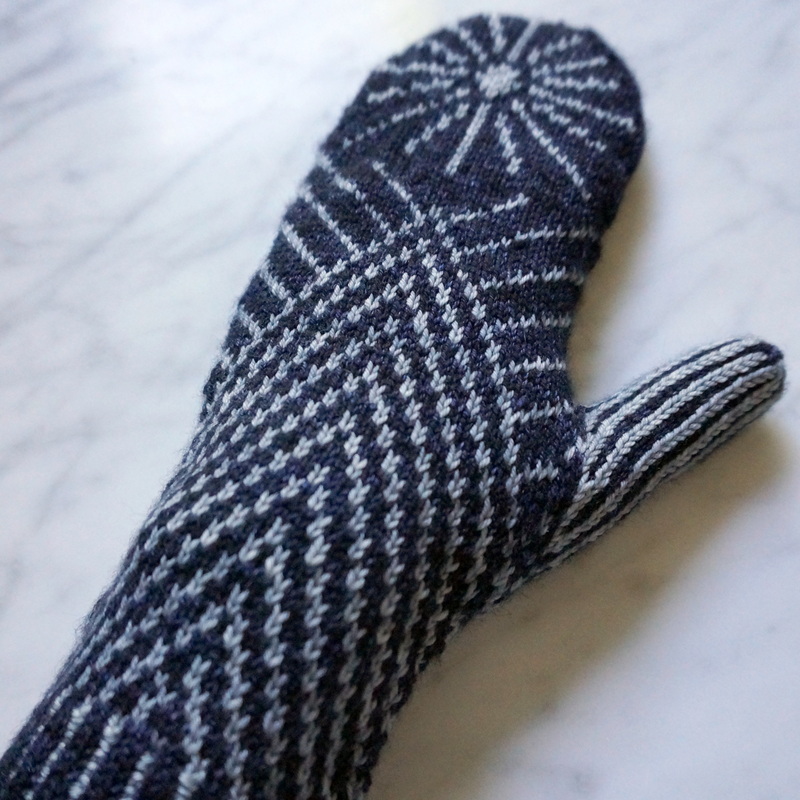 These mittens are my homage to the tall mountains and sunny skies of Alberta. The original sample was knit in my own hand-dyed yarn. I loved how it looked in the navy blue and silver. But, when moving, I decided that the yarn-dyeing operation was best left on hold. Then I was left not wanting to have a pattern only suggesting a yarn that wasn’t commercially available. So, I picked up some incredible Mrs. Crosby Trunk Case from The Salty Sheep while on vacation in Swansboro, NC. The new sample is knit up in Hollywood Cerise and African Grey – both stunning colours with such depth and subtle variation. The pattern is now available for purchase on Ravelry and Love Knitting. I hope you like it, happy knitting!